Destroy your friends in the challenge of a lifetime! 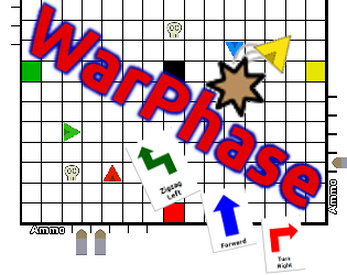 Draw your movements as cards from a deck, plan your moves, and go! Make the best of what you get, plan the best course, and shoot down your opponents. WarPhase is a competitive strategy board game for 2 or 4 players provided for free in a Print & Play format: just print it out, cut out the cards and pieces, and play! Players draw movement cards from a deck and use what movements they have to plan the best trail across the board. Sacrifice a move to get ammunition, and shoot down your opponents before they shoot you!